"The Scoville scale is a measurement of the spicy heat (See: Piquance) of a chili pepper according to its capsaicin content. Capsaicin is a chemical compound that stimulates chemoreceptor nerve endings in the skin, especially the mucous membranes. The number of Scoville heat units (SHU) indicates the amount of capsaicin present. 8,600,000–9,100,000 Various capsaicinoids (e.g., homocapsaicin, homodihydrocapsaicin, nordihydrocapsaicin). 5,000,000–5,300,000 Law Enforcement Grade pepper spray, FN 303 irritant ammunition. 855,000–1,075,000 Bhut Jolokia (Naga Jolokia). 100,000–350,000 Guntur Chilli, Habanero chili, Scotch Bonnet Pepper, Datil pepper, Rocoto, African Birdseye, Madame Jeanette, Jamaican Hot Pepper. 50,000–100,000 Bird's eye chili/Thai Pepper/Indian Pepper, Malagueta Pepper, Chiltepin Pepper, Pequin Pepper. 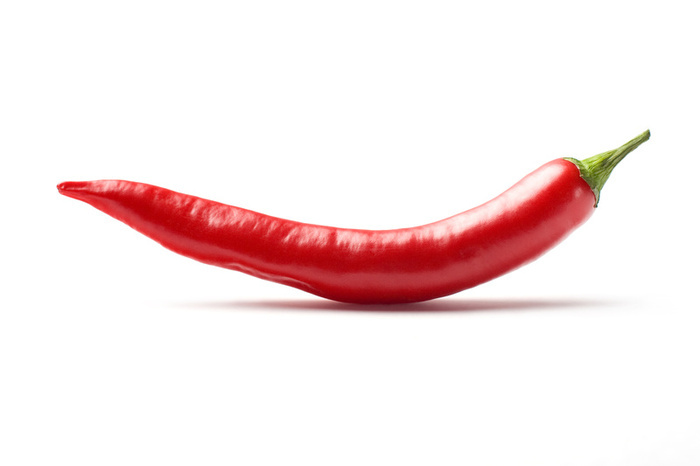 30,000–50,000 Cayenne Pepper, Ají pepper, Tabasco pepper, Cumari pepper (Capsicum Chinese). 2,500–8,000 Jalapeño Pepper, Guajillo pepper, New Mexican varieties of Anaheim pepper, Paprika (Hungarian wax pepper), Tabasco Sauce. 500–2,500 Anaheim pepper, Poblano Pepper, Rocotillo Pepper, Peppadew.